Are We Good Candidates for Mediation? Jennifer E. Davis has been a practicing lawyer since 1987, and has had an exclusive focus upon the areas of Family Law since 1992. She has a passion for alternative dispute resolution, which includes collaborative law, mediation and the conduction of settlement negotiations. Because she is a skilled and competent litigator with many years of courtroom experience, she brings a high level of understanding to the needs of families to resolve their issues outside of a courtroom whenever possible. Since the early 1990s, Jennifer has served as a guardian ad litem, a role which allows her to represent the best interests of children in families experiencing a high level of conflict. In order to really understand families and children, Jennifer has taken trainings in child development, language acquisition in children and substance abuse treatments for adults. She continues to broaden her education in these areas. Jennifer received her mediation certification in 1995 and her collaborative attorney certification in 2004. She has since taken a number of advanced trainings in collaborative law as well as mediation as she continues to explore the questions surrounding how to help people settle their differences. 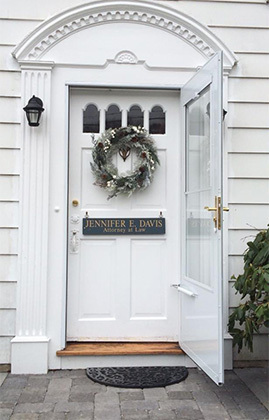 Jennifer is a founding member of the Central Connecticut Collaborative Family Law Group (CCCFLG) as well as Connecticut Collaborative Divorce Group (CCDG) which is an interdisciplinary association of collaborative professionals dedicated to alternative dispute resolution. She currently serves as a Special Master for the Regional Family Trial Docket as well as for the Hartford, New Britain and Litchfield jurisdictional districts. She is a past board member of the Children’s Law Center and a past member of the Oliver Ellsworth Inns at Court. Jennifer E. Davis has been practicing exclusively in the area of Family Law since 1992. She understands that when you bring your family issues into a law firm, you deserve a firm that you can trust, and one that will bring knowledge, skill and experience in addressing your concerns. It is a privilege to work with families and to assist them in resolving their differences productively, affordably and compassionately. Coming to the end of a marriage can be a highly emotional and difficult time, often involving the need to resolve issues concerning children, support issues and the division of property. You have options here in Connecticut revolving around the choice of divorce process. Each party can hire an attorney to represent their interests (known as litigated divorce), or they can meet with a neutral mediator, or they can work as a collaborative team with their attorneys. Attorney Davis is trained and experienced in all three processes. "Jennifer E. Davis has been a practicing lawyer since 1987, and has had an exclusive focus upon the areas of Family Law since 1992. She has a passion for alternative dispute resolution, which includes collaborative law, mediation and the conduction of settlement negotiations. Because she is a skilled and competent litigator with many years of courtroom experience, she brings a high level of understanding to the needs of families to resolve their issues outside of a courtroom whenever possible." "Thank you for recommending Attorney Jennifer Davis to help in my recent divorce. She did a great job at a very reasonable price. I would highly recommend her to anyone for Divorce matters." - Joseph M.
"Attorney Jennifer Davis represented me during an extremely difficult divorce proceeding which resulted in trial. Her high level of knowledge, professionalism, integrity, experience and determination along with her ability to treat me with respect and kindness helped ease an unbearable situation. I highly recommend Attorney Davis without any reservation." - Beth S.